You must know this about the Pearl of Great Price. Finding it is not fortuitous. Indeed, to discover it is to know that, without it, your life couldn’t have been the same, couldn’t have been your life. Career choices are not, in themselves, pearls of great price. Why not? Because most all of us make them, and many of us are wrong about them. No, this Gospel simile is about more than making a decision. Once espied, one sacrifices everything for the pearl. All else pales before its iridescence. Some might say that any career in theatre, in film, or on television would be a pearl they’d both recognize and prize. Who couldn’t devote one’s life to that? That’s always the excuse of those who hear, but do not grasp, the Gospel. If only things were different. I would have recognized her pearl. But the jewel comes into each one’s hands. The question is, perceiving it. Some might also suggest that show business has little to do with salvation, but the Gospel is addressed to every life, not only those that seem to be religious. We don’t serve God by choosing something celestial. That’s for the angels. We serve God by altering the earth on which we live. What else do you need to know about the Pearl of Great Price? It fills one’s life with energy, because lives are empowered by purpose. 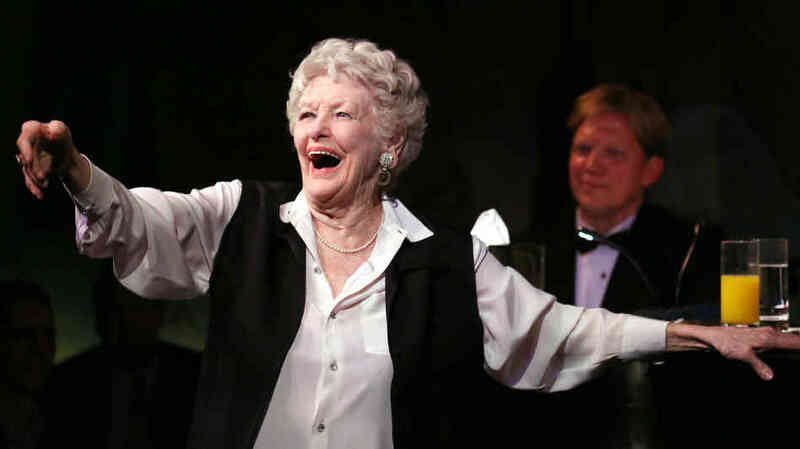 Elaine Stritch’s life on Broadway spanned almost seven decades, but many of those years were not to be envied. She understudied Ethel Mermen in Call Me Madam, but never took the stage, and, as The New York Times put it, “Ms. Stritch might be the only actor ever to work as a bartender after starring on Broadway.” What energized Elaine’s life was, quite literally, the joy of entertaining. Note that noun. It’s almost always a mark of the Holy Spirit: whatever the troubles, a joy sings over them. It’s sixteen songs a night I sing, and then I link them together with a few intimate stories about my personal, private life, how I react to things, and some old boyfriends I’ve had in my life that haven’t been too successful, and then you find a song and fit it to it. This is the hardest work I’ve ever done in my life. It ain’t easy. I think the theatre is easier. I think making a movie is… I think anything is easier than a cabaret. I think it’s tough. But I’ll tell you something. I’m beginning to enjoy it. The reason I’m beginning to enjoy it is because you’re beginning to enjoy it. The public seems to like what I do up there. And boy, talk about not only the best tonic in the world, the only tonic in the world. It’s the only thing that keeps me what I’m doing. If you check out on me, I wait table—Madame Librarian, anything I can do—but I’m not going to perform unless you want me to. And finally, remember that the pearl must be purchased. It’s invaluable, but a price must be paid. Elaine Stritch wanted people to love her, to love the insecure, shy girl from Detroit. Yet even before she entered high school, she had discovered a way to dull that desire. It all started in the sunken living room on Bridgecrest Drive. My mother and father were having cocktails one night, and I was almost fourteen years old. And so, my father shook up what must have been a mean Whiskey Sour and he gave me half and I drank it. A star was born. Elaine’s pearl was entertaining her way to love. Drinking, the hard shell that always threatened to close up on it. But grace triumphed in Elaine’s life. I’m an alcoholic. I’m a recovering, ongoing recovering alcoholic and when I got sober I began to realize that I had choices. I could make choices. I didn’t have to do what I, I didn’t have to have five, six, seven martinis. I wasn’t drunk every day, but I drank every day. I think that’s a good way of putting it. I wasn’t drunk everyday but I drank every day. I’m so glad I don’t anymore. I miss it. How I miss it. How I miss it. And by the time that anybody hears me say all these smart things about alcohol I’ll be long gone and I won’t have the problem anymore. The problem is behind her, but the pearl remains. We have a treasure now, what she gave us. To have heard Elaine Stritch sing Stephen’s Sondheim’s The Ladies Who Lunchis to know why the human heart must be redeemed. And Elaine? She bartered the pearl for heaven itself. Because to hold such a pearl in one’s hands is to pound on the next life’s door, knowing who you were in this one, who you were meant to be. Give Elaine have the last word. Remember, when you must fill in the ellipses, she had been a convent school girl, but she became something hard and lustrous, a pearl. I’m dealing now, with the age I’m getting to, of being so long in the theater. How is “the end of pretend” going to be? How’s it going be? How am I going to get along with that? And it scares the ____ out of me. The fear is all part of the excitement. There is something exciting about being afraid. I pray that I may live expectantly. To live expectantly: What’s gonna happen on Sunday? And Sunday, what’s gonna happen on Monday. In the meantime, stay where you ___ing are, and enjoy it. Bravo, Padre. Bravo! Wasn't it Merton who said, "Live. Really live."